A 9-kilometer digital test bed for automated and connected driving is currently being constructed in the city of Hamburg, with completion scheduled for 2020. To that end, the Free and Hanseatic City of Hamburg is successively upgrading traffic lights with components for infrastructure-to-vehicle (I2V) and vehicle-to-infrastructure (V2I) communication. 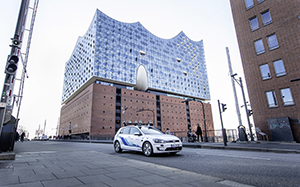 Volkswagen and the city of Hamburg are thus taking a decisive step to further optimising traffic flows through digitalisation and to full-size implementation of automated driving in the city area. triggering any false alarms. Several different artificial intelligence approaches are used: these include deep learning, neural networks and pattern recognition. For safety reasons, specially trained test drivers will be seated behind the steering wheel during all test drives in Hamburg to constantly monitor all driving functions and intervene in an emergency. Furthermore, all data protection rules will be fully taken into account. Volkswagen Group Research is collaborating with all brands and relevant Group departments to enable the functionality of automated driving on public roads – right through to Level 5. The findings of this project will be successively incorporated in further research and development initiatives. The goal is to be in a position to offer customers concrete products for the automated transport of goods and passengers on public roads a few years from now. This will contribute to lasting improvements in traffic flows and road safety. However, automated driving without a safety driver in public traffic requires changes in the legislative framework and the availability of the necessary infrastructure. 1) Power consumption, kWh / 100 km: combined 14.1 with 17-inch wheels – 13.2 16-inch; combined CO₂ emissions, g/km: 0; efficiency class: A+.